Black and white version of "Older Yet Faster" (book with illustrations and photos, and online lesson and exercise videos). This is a manual for teaching runners how to transition to efficient running and to help them to avoid incurring almost all of the common running injuries as they do so. It is ideal for beginners to learn how to run well and for experienced runners to changeover to good technique. 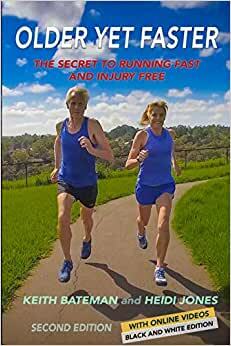 Coaches can also use this book as a reference on how to implement technique change for their clients, and we expect it to become the go-to manual for medical professionals, to help them deal with running related injuries caused by bad technique and footwear.After learning how injuries are caused and then gaining a good understanding of running technique in the early chapters you will be prepared to read about our technique-change system which we call "OYF Running." This consists of "Keith's Lessons" used in combination with "Heidi's Strengthening Exercises" and forms the main body of the book." Keith shows you how to run efficiently in a simple, step-by-step guide both in the book and with videos. Each Lesson provides exercises set out in a format which is both easy to understand and implement. The first three lessons teach you the basics of running correctly and the last three help you put these into practice and help you to refine your technique over the period of your transition. This program is set up so that runners can teach themselves in conjunction with the online videos and forum.Heidi's Strengthening Exercises consists of a well-ordered series of exercises which will help your body safely adjust to the redistribution of the workload and are essential to rebuild parts of the body which have been neglected due to poor technique. It should be started as soon as possible, in order to build strength and to deal with the resultant muscle and tendon soreness that you will start to experience. We identify specific injuries and how they are caused and we show how by improving running technique, and re-strengthening these injuries are quickly cured. Podiatrists will find Heidi's experiences and advice particularly interesting, especially as they will almost certainly, be in conflict with what is still taught in universities. Chapters Twelve and Thirteen, 'Managing the changes' and 'Rehabilitation', explain what should happen during the transition and what to do should you get injured, or if you are currently injured. Chapter Fourteen is very important as you must have suitable footwear to run with good technique. There is then a chapter on how your body shape will change as you adopt your new technique and a chapter on general tips and traps a list of commonly used terms, a glossary and an index.Finally, we have included three appendices: For Coaches, For Podiatrists and a detailed look at Heidi's strengthening program. In Appendix A, Keith discusses how to implement his Lessons from a coach's point of view, in Appendix B, Heidi explains how she treats her patients who are suffering with specific injuries and in Appendix C she explains her Strengthening program in greater detail for medical professionals and interested runners. Start reading Older Yet Faster: The Secret to Running Fast and Injury Free on your Kindle in under a minute.